When looking for the best source of Vitamin-C for my SuperFood Plus, I experimented with many of the available sources. Many had great claims of high amounts of Vitamin-C, but when we tested them, they were actually poor sources. Vitamin-C, like many nutrients, is very sensitive and very perishable. We tried many new-fad berries from the Amazon rainforest and other places, but the high Vitamin-C content was not stable. So they were Vitamin-C rich on the bush, but by the time they reached me, or eventually you, they had little or no Vitamin-C content at all. 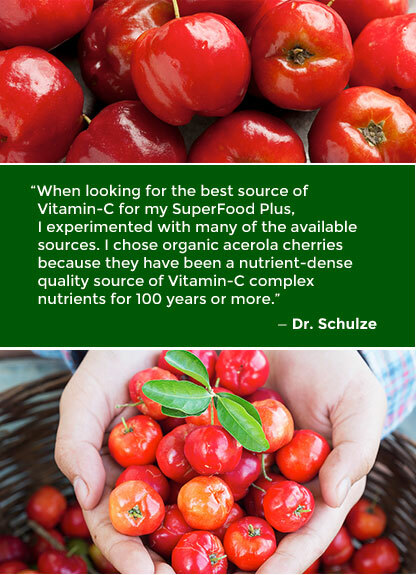 On the other hand, organic Acerola cherries have been a nutrient-dense quality source of Vitamin-C complex nutrients for 100 years or more. The Vitamin-C and C-complex nutrients in the cherries are very stable, and when we add a little tapioca powder, it locks in the Vitamin-C. Most of the ascorbic acid used in vitamin pills on the market is synthetically manufactured out of sugar. (Remember my SuperFood story about the sources for many vitamins and minerals?) Even though it is synthetically made, it is called natural Vitamin-C because, after all, sugar is natural. Also, consumers are often very misguided by the combination of ascorbic acid and Acerola, which creates the erroneous implication that it is made with only natural Vitamin-C. I use only 100% organic, natural Acerola cherries. They are picked in their most potent stage of development and not produced in a factory in chemical chambers. This means our Acerola also contains other naturally occurring nutrients like beta-carotene, Vitamin-B1, Vitamin-B2, niacin, iron, phosphorous, calcium and bioflavonoids. In other words, it is a broad spectrum Vitamin-C complex. The Vitamin-C is also stabilized by organic manioc root powder instead of synthesized maltodextrin or other anti-caking or flowing agents. Acerola cherries are one of the richest sources of 100% natural Vitamin-C complex in the world. They contain whole-plant bioflavonoids, hesperidin, rutin, anthocyanins and other naturally occurring essential co-factors. The Vitamin-C content of these ripe Acerola cherries is so potent, it accounts for almost 90% of the Vitamin-C content of SuperFood Plus, all by itself. Acerola cherries are 42 times richer in Vitamin-C than oranges.